P4 and P5 are terrible names for servants of a king, so astronomers want your help picking new ones. Pluto, king of the underworld and former planet, has had two new moons discovered in the past two years, and the team of SETI astronomers who found them wants you to vote to name them. The two moons are currently called P4 and P5, but via the website Pluto Rocks, members of the public can freely vote on a list of mythical greek names for the orbiting rocks. If you like, you can also submit alternate Hades-themed names for the moons. Among the proposed names are such underworld luminaries as Cerberus, Erebus, Eurydice, Lethe, Persephone, and Styx. 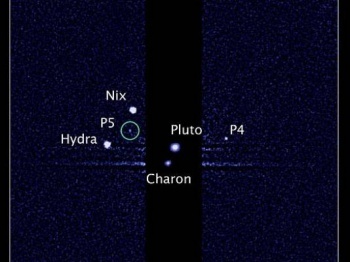 Pluto's current moons are named Charon, Nix, and Hydra. Voting will close at noon EST on Monday, February 25, 2013. Mark Showalter, the head of the SETI institute team that discovered P4 and P5, said on the website that "The Greeks were great storytellers and the 'Minions of Hades' are a colorful cast of characters. We have picked out a few of our favorite names to get the voting started, but if you have a better idea, let us know and we might add it to the ballot!" Clyde Tombaugh discovered Pluto in 1930, and a little girl from Oxford, England suggested that he name it Pluto. Opening up the voting to the public, says Showalter, is in the spirit of Tombaugh's discovery. Under the Nomenclature Working Groups of the International Astronomical Union, Showalter's SETI team has the right to name the moons and put those names to a vote by the IAU. SETI Institute is a not-for-profit organization which studies the universe, with an aim at the search for life.